Last weekend saw the start of the Six Nations and an opening tie between Wales and Ireland. As ever the atmosphere around my home city of Cardiff was incredible - no doubt the same across the Irish Sea in Dublin. In fact Dublin has had a lot to be cheerful for over the past year following the Republic's football team qualifying for Euro 2016 alongside England, Wales and its neighbour across the border to the North. Watching the rugby however was what prompted the start of this piece - as both Northern and Republic came together to compete side-by-side on Saturday. Irish sport indeed sees its roots deep in a mixture of social and political constraints - but why? Here at TFHB, we tend to focus the great deal of our writing on British sport and its intriguing history. Of course 'the Republic of Ireland is not part of Britain' I hear you say....but until 1921 it was and it is in these earliest years that the next 90 years of Irish sport were to be set out - sometimes for the better, sometimes for the opposite. This piece is not to just look at football or rugby, but to explore the foundations of other Irish pastimes - 'Gaelic football, hurling and even golf' - how did these sports develop? Who played them? Why did they play them? We'll start with football however - it has been written in great detail about the establishment of the Football Association in 1863 by English public school alumni and its general growth throughout England, Scotland and Wales - but what of Ireland? The Great Potato Famine (1845-52) had ravaged the Irish countryside leading to the death and starvation of over a million people, with widespread emigration from the island also felt in a number of British cities. Indeed, my own ancestral heritage can date back to the famine with the mass arrival of Irish people in Cardiff. The remnants of such tragedy are still felt today with a justifiable bitterness felt towards Westminster after their shambolic, pragmatic response to such devastation. Events like those between 1845-52 were to sow the seeds for the next 150 years of Irish-British relations with sport often on the frontline of political and social conflict. So where does football fit into this? Indeed, reference to the association game in Ireland is difficult to find before 1900. The ambiguity of 'football' before 1900 provides a frustrating mix of football (soccer), football (rugby) and football (gaelic)! However, it is possible to see football finally taking hold in the 1880s - in the North of the island. In 1883, the Irish sent a side to compete in the first 'British Home Championships', albeit becoming the tournament's whipping-boys in process! The earliest XIs consisted of mainly players based in present-day Northern Ireland - including 15 year-old Samuel Johnston - who to this day remains the youngest ever Irish international. Indeed club football began to take off around the same time - played mainly in cities like Ulster, Belfast and Dublin with a growing number of spectators and punters. It was in 1921 however, that football in Ireland met its first major hurdle - in fact the whole of Ireland was to change forever. The establishment of an Irish Free State after centuries of struggle meant that the country was split in two. This meant that sport would soon come into question, what to do with the national team? The Football Association of Ireland (FAI) was set up in the south in order to compete with its Northern counterpart (IFA) - something to many people, either side of the sectarian divide's disdain. IRISH APPLICATION REFUSED, An application was read from the new Football Association formed in Ireland, a secession from the present governing body, called the Irish Football Association (Limited), for recognition by to become members of the International Board. The following resolution was unanimously passed:—" That under present constitution of the International Board not competent for this Board to admit members' the new Football Association of Ireland." The unanimous opinion was expressed that country could be represented by two associations." Indeed in football, until 1950 the Irish XI was to continue picking players from each side of the border - notabally players like Liverpool legend Elisha Scott. However, further sectarian issues would eventually mean that a split was inevitable with 'Northern Ireland' competing in the 1954 World Cup. Football in the Republic and North has struggled at a club level with a lack of resources to implement a professionalism on a par with Britian - but a wealth of players have played across Europe and earned a living from the game. "If any two purposes should go together they ought to be politics and athletics. A political people we must the exigencies of our situation force us into perpetual war with England...Our politics being essentially national, so should our athletics. we must maintain a stout physique, and cultivate a hardy constitution." Gaelic Football was to provide this political edge to Irish sport - being at the forefront of a 'new Irish resistance to British culture in the late nineteenth century'. In 1884 the Gaelic Athletic Association was formed in response to the wider influx of British culture and imports - the idea was to resurrect the ancient games of Ireland like hurling. Although a gamble, Gaelic Football was to be a mixture of both the association game, seen prominently in Dublin (where British presence was strong), and hurling. The game permitted handling, kicking and bouncing of the ball, an innovation successful in its restriction of the spread of soccer. The sport is played 15-a-side with rugby style posts not too dissimilar to Aussie Rules Football. Hurling makes for intriguing discovery - a game which admittedly I know very little about but one which helps encompass the spirit of Irish identity. The game, like Gaelic Football, received almost immediate popularity becoming an important symbol for nationalism at the turn of the century. At politician Charles Stewart Parnell's funeral in 1891 two thousand 'hurleys' in national colours were borne aloft. The hurley was a symbol for Irish freedom - 'a weapon to drive out the British'. Parnell had in fact played a key role in the promotion of Gaelic sports following to rise in power over multiple British governments, leading to a greater Irish representation in parliament. Holt continues his politicised recording of Irish sport when writes that the early history of the GAA is arguably the most striking example of politics shaping sport in modern history. This is supported by the GAA's ban on all foreign (British) sports in 1887. However, due to such resentment from Irish nationalists at a sporting level, the landed classes found themselves an incentive to compete in other sports - indeed the gentry ladies were frequently seen playing both golf and tennis from the outset. It was in a Gaelic Football match however that Anglo-Irish relations came to a head with the shooting of thirteen people at Croke Park on 'Bloody Sunday' - among the dead was Tipperary player Michael Hogan. The GAA eventually began to become a active representation of rural, Catholic Ireland. Terrible scenes took place during the Tipperary v. Dublin football at Croke park which was attended between 12,000 and 15,000 people. Sometime after the match was in progress, a dozen lorries, containing armed and uniformed men arrived, converging from different points. Machine guns were plated on the railway lines dominating the ground The gates were forced, and volleys were fired. The first was the air, and then volleys were poured into the crowd and it is stated that beyond the firing into the air no warning to disperse was given. Terrifying spectacles ensued, men, women and children rushing in stampede, screaming in fear. One of the first shot was a prominent Tipperary player, Michael Hogan, who was killed the field of play and some the crowd afterwards gathered round, kneeling and reciting prayers." 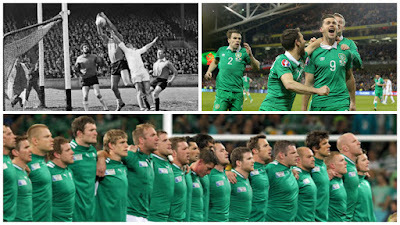 It makes for horrific reading, but it is an event which has no doubt shaped modern Ireland and the hostility still felt towards the English crown.There is little doubt that sectarian and political conflict have played key roles in the shaping of modern Ireland and Irish sport, but one game has escaped such ruthless diversification - rugby. As with the game in the United Kingdom the role of class plays an integral role in this apolitical status. The middle-class college alumni helped to develop the game in Ireland and establish the Irish Rugby Union in 1879 - leading to hostility from the GAA. Nonetheless, even after partition in 1922 a unity between middle-class outcasts meant that internationals were still played by 'Ireland' in both Belfast and Dublin. The game was predominantly one for the protestant middle-classes, different to its Gaelic counterparts but one which has stood the test of time. The current 6 Nations Irish squad boasts a mixture of the two nationalities - albeit with a greater southern representation. However, captain Rory Best is indeed from the north of the island. It is of note that the urban working-class support of the national team has also remained relatively unscathed throughout the 20th and 21st centuries. The anthem 'Ireland's Call' was adopted in 1995 by the Irish Rugby Football Union (IRFU), representing the whole island in the process. When watching Irish rugby it is not uncommon to feel the hairs on the back of your neck stand up as the sheer passion of the spectators is felt. The anthem is often sang with such intensity that supporters are moved to tears. So there we have it a rather brief early history of Irish sport - what is clear however is that sport has played an integral part in the shaping of modern-day Ireland. Through the study of these different games and pastimes, events and social context often brushed beneath the carpet by the British press can come to light. Through the GAA an Irish nationalism could flourish eventually leading to an Irish Free State and the formation of a new national identity. Sectarian divides have unfortunately cast a dark shadow both sides of the border in recent memory leading to violence and the breaking of many relationships. 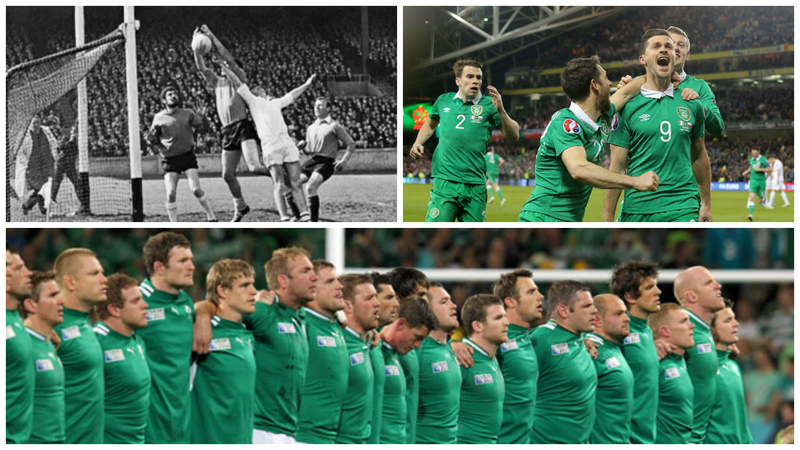 This summer's European Championship will provide an interesting revival Ireland's past as North and Eire compete on opposite sides. However, what has often remained a symbol of togetherness is sport and in particular rugby. The rugby team has shown how two nations can be joined together to represent a wider community. Indeed it is Ireland together - standing tall.